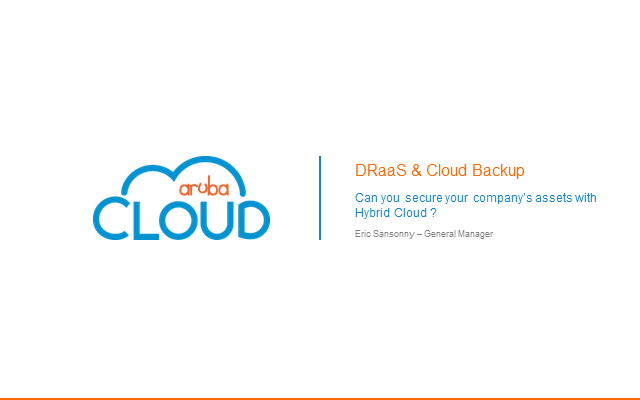 DRaaS and Cloud Backup: Can you secure your company's assets with Hybrid Cloud? Ensuring Business continuity and managing risks is becoming more and more crucial for companies heavily relying on technical infrastructure to run their business such as CRM, ERP, CMS, accounting, big data and more. Todays's economy cannot be conceived without the use of such systems, more and more connected and presumably accessible from everywhere. Data is now the key asset of any company, and needs to be protected the same way as everyone protects their assets. But the reality is far from this. So many companies are "saving" money by using non-redundant infrastructures, networks or servers, and often have to experience the worst scenario to start digging into Disaster Recovery, but it's already too late. So join Eric Sansonny as he looks at Disaster Recovery as a Service and Cloud Backups to see if the solution lies there. Going Hybrid: The First Step to Your Enterprise Cloud Journey. The Public Cloud is very useful when high flexibility is needed in terms of allocation and de-allocation of resources, it allows an easily and fast scalability of horizontal architectures while it could be limited when there is the necessity of complex multi-level architectures. The Private Cloud is more enterprise oriented; as it allows the creation of complex architectures, providing tools in order to easy manage the network, the storage and specific VM configurations at hardware level. The user will have a Virtual Data Center that implements all the abstractions designed to simulate the behavior of a physical environment. It is also possible to configure network architectures involving multi-level services firewalling , load balancing , routed or isolated network, VPN profiles and to have different storage in terms of performance based on specific needs (for example, it will be possible have a database on pure SSD space, or long term archive space based on SATA disks). Join this presentation as Eric Sansonny will explain all of the above, and how to use a VPN IPSec to create a hybrid environment. The evolution of datacenter management in the past decades has led us to switch from pure physical to remote management helped by the introduction of software such as Virtualization and monitoring tools. Lately, with the development of IaaS services including Cloud Computing or Cloud Object Storage, the concept of SDDC has become even more valid and is now seen as a real facilitator for CTOs to manage complex infrastructures in an easier and more flexible way. Join Aruba's Managing Director, Eric Sansonny, as he shows you one of the simplest ways to utilise this development by expanding your datacenter through the cloud. This additional infrastructure capacity can be created and managed remotely and utilised for virtual machines (Hypervisor, OS, RAM, CPU, Disk Space), network appliances, IP addresses, unified storage and load balancers. Attend live and discover how you could be making more of the software-defined revolution.